How to get there: A good point of reference is Folldal, Folldal is 28 kilometer along Hwy. 29, from Hwy. E-6 at Hjerkinn on Dovrefjell. Measure from the intersection between Hwy. 27 (from the south) and Hwy. 29. Continue east along Hwy. 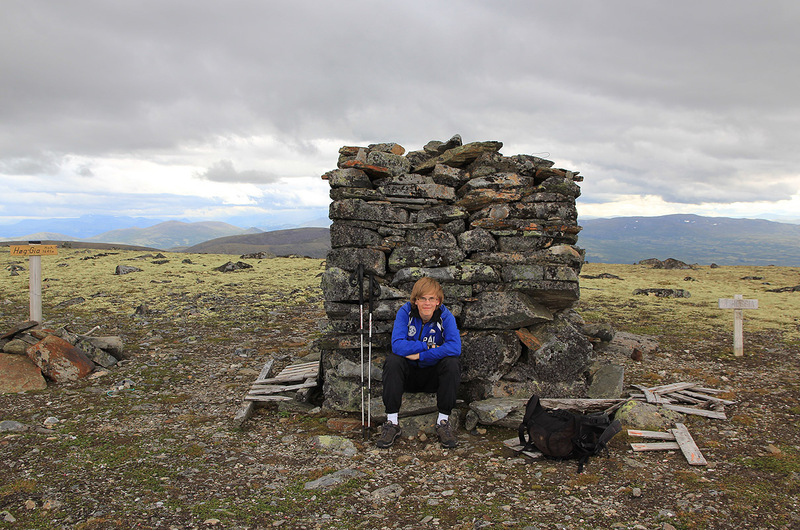 29 (towards Tynset) 19.1 kilometer. Locate a road that goes sharply left and uphill, the sign should read Einunndalen. Turn onto this road, almost immediately (kilometer 19.3), stop and pay toll. 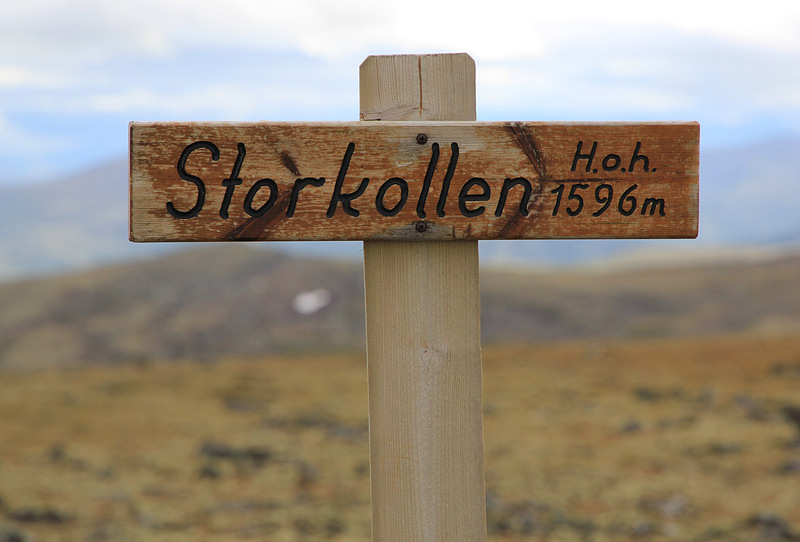 In 2010, the toll was NOK 60, collected by a man stationed there. Continue to kilometer 21.7, and keep left where the road forks. At kilometer 30.7, you drive across the river, then at kilometer 31, go right where the road forks. There is a small sign "Gløta". The road is now smaller, but in good condition. 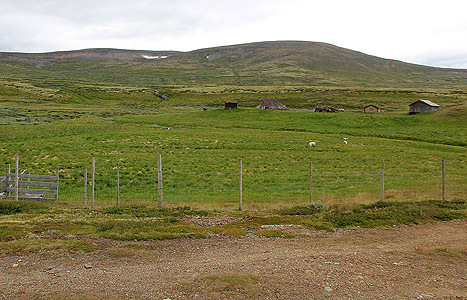 Continue until kilometer 42.6, you are now at the innermost mountain farm huts at Gløtleger. This is the trailhead, park here at location N62:21.752, E010:11.204, elevation about 1090 meter. Route description: Storkollen is visible to the north-west from the trailhead. Your objective, Høg-Gia, is not visible, but located behind, slightly on the left side of the Storkollen summit. From the parking, head across the first field directly towards a big rock that is located between a few farm buildings. You may have to cross a few fences. Behind this big rock, you should be able to locate a trail that heads towards the mountain. This trail is a bit fuzzy in the very beginning, but becomes very clear and nice after a short while. Follow this trail, it crosses the stream and gradually heads uphill on the right side of a small creek that comes down from higher terrain. When this trail becomes less clear (quite a good way up the first slope), there are two possible ways. The shortest and most direct way is to cross the creek, then continue uphill while also going gradually left. This uphill section should get you directly to the col between Storkollen (1596 m) and Høg-Gia. Thsi col is about 1548 meter and located at N62:22.583, E010:08.104. 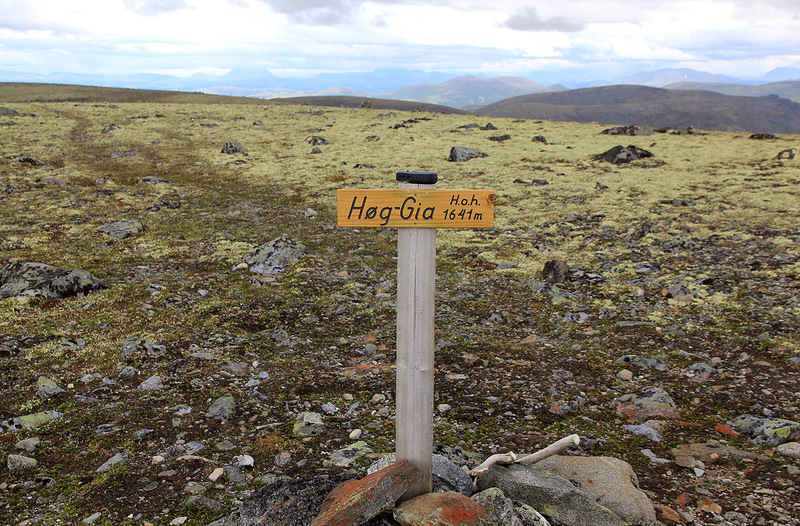 Continue a gradual traverse ascending to your left until you reach the main ridge of Høg-Gia, then an almost flat section in order to gain the summit and its very impressive cairn. The alternative route would be to climb right instead of crossing the creek. Continue to the main ridge higher up, then follow this to the summit of Storkollen, 1596 meter, location N62:22.780, E010:08.696. There is a sign with name and elevation. This top has only about 40 meter of prominence aand cannot be called an independent summit. Continue across this flat top and descend slightly to the saddle described above. This route is slightly longer, but perhaps a bit easier in terms of terrain ans slope. Comments: I did this trip with my son Pål Jørgen. 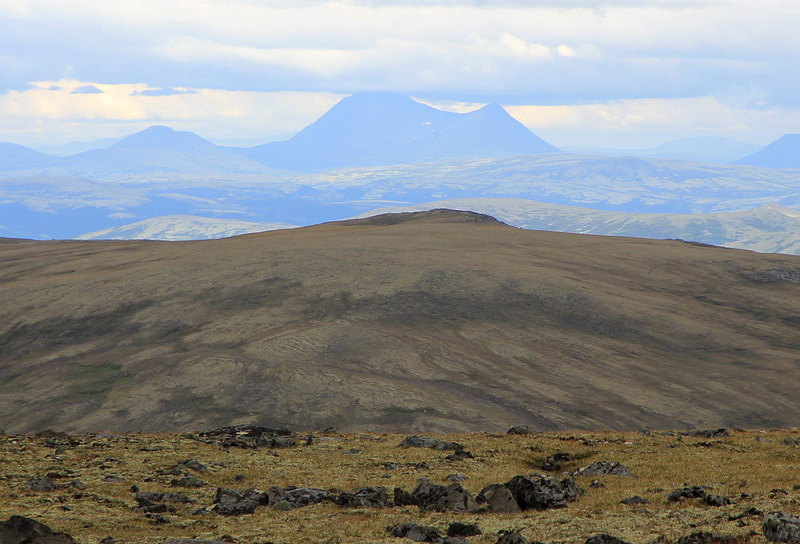 We had already climbed Gråhøgda before driving across to this pretty isoloated peak. The landscape and the drive to this trailhead is absolutely gorgeous. We parked and were ready to go by 1615. We missed the trail and did not see it until the start of the slope with the small creek. We decided to go right and hike across Storkollen along the way. 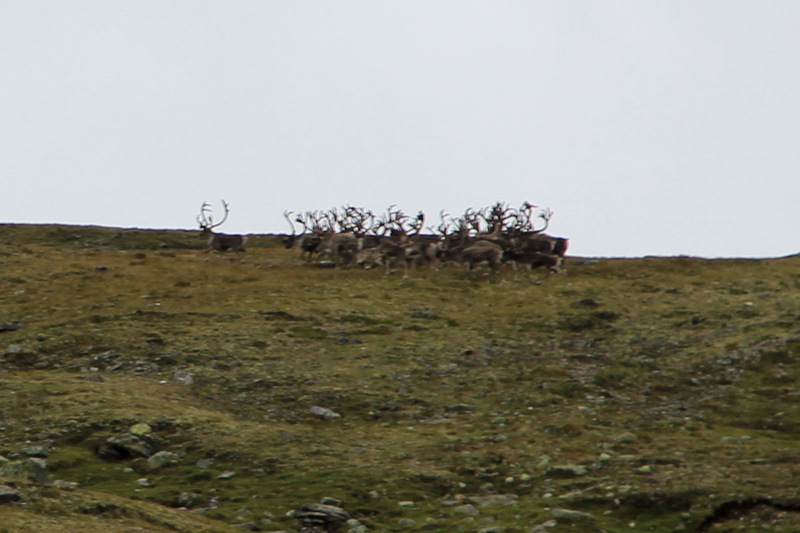 A small group of reindeer was visible on top of the ridge. The terrain in this area is very nice to hike, in fact, there are very few places in Norway where you can walk on soft reindeer-moss above 1600 meter. We arrived at the very impressive cairn 1.5 hours after starting out, at 1745. The weather was cloudy, but no rain. We took some pictures, then headed back down at 1755, knowing that we needed some luck to find dinner if we waited any longer. We took the more direct route back down and this time followed the trail all the way back to the mountain huts near the trailhead. Back at 1850, so slightly less than one hour. We drove back to Folldal and south on Hwy. 27, then right on the toll road to Døråseter (NOK 50 in 2010). They still served dinner, so the day ended very well. 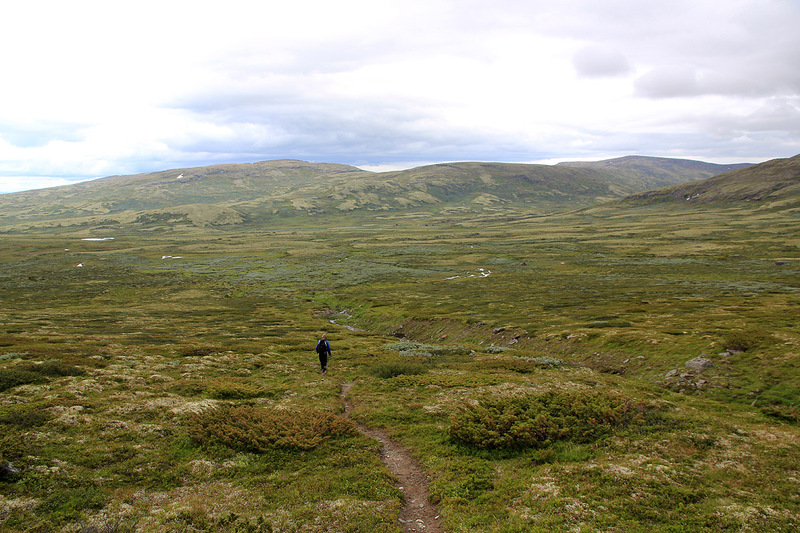 Tomorrow, we shall climb Høgronden, at 2115 meter, a major peak in Rondane. View from the trailhead. Note the big rock where the trail starts. The shortest route climbs just left of Storkollen. Storsølnkletten, as seen from Storkollen.